Congratulations to a local @Starbucks for kicking out @Loftedpanda who has PSORIASIS because people thought it was Ebola. Idiots. So let's look at this for a minute. First off, there's no video available of this event - the only evidence that this happened is from this tweet. I've done some digging around and the coffee shop in question haven't issued any comments about the incident (that I can find) and there's been no news coverage of it. But, for the sake of this post, we'll assume that it did happen. Because I generally find, that apart from those of us who suffer from it, not that many people seem to be very clued up about the disease anyway. Secondly, there's quite a bit of panic about Ebola at the moment. It's a scary illness, I get that. Psoriasis, on the other hand, is more annoying than it is scary. 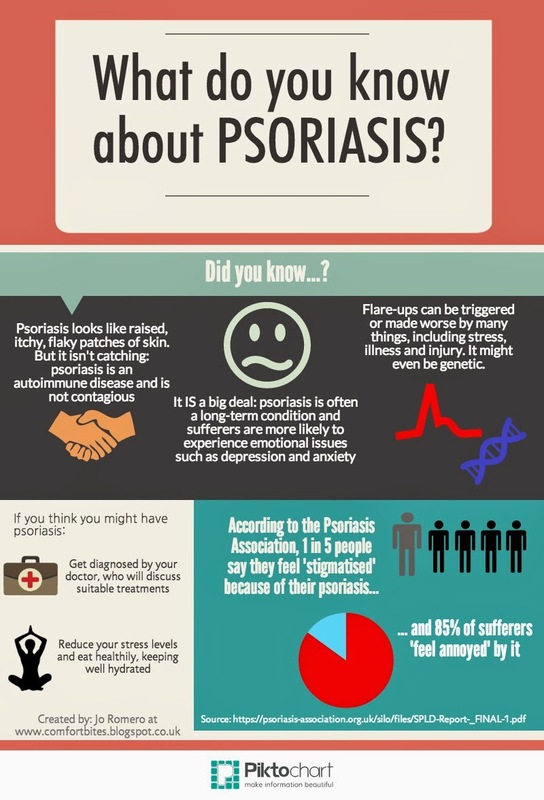 But then people don't know much about psoriasis, even though it already affects millions of people around the world. But I think it's not quite fair to launch attacks at multi-millionaire global organisations, or their employees. The real problem here is that a lot of people know NOTHING about what psoriasis is, or even what it looks like. We psoriasis sufferers probably haven't helped matters. We try and hide our red, scaly patches with clothes or makeup. If someone asks us what it is, we might shuffle and say 'Oh, it's just dandruff' because we don't want to get into a long conversation about autoimmune diseases. Psoriasis is not catching. You can't get it from skin to skin contact with someone who has flaky psoriasis patches. And you don't get it ON PURPOSE. The patches of red, scaly skin are a symptom of something underlying - that's not really on the skin at all - but indicate some sort of problem with the immune system. They can be brought on by stress, illness or injury. There's evidence that it might even be passed on through our genes. Bottom line is - it's not your fault. I've seen people politely but clearly back away from me, because I've had psoriasis. Children are more honest - they just ask you outright why you have sugar in your hair, usually on a crowded bus or train. Hairdressers would part my hair and make a face to themselves, or to colleagues, as they saw the inflamed and often bloody patches on my scalp. I can SEE you in the mirror, I wanted to say. But never did. There are emotional problems, too. Psoriasis sufferers are thought to be more likely to suffer with depression and anxiety. The Psoriasis Association reported that 10% of sufferers had considered suicide and 1 in 5 of people with the disease feel "stigmatised" by their condition. This all isn't helped by behaviour that's described in the tweet above - being refused service, while people run away screaming. Yeah, that's going to do a lot for your self-confidence. So I made this little picture. Share it if you like. In a snapshot, it sums up some of the main points about psoriasis, and reminds us to be mindful if we come across others who have it. I'm sure the hairdressers I'd been to didn't really want to hurt my feelings - they probably just thought: "What the HECK is THAT in her hair??". And the people that are linked to this tweet - if they'd known it was psoriasis and not contagious - and certainly nothing to do with Ebola - I expect they wouldn't have behaved that way and just written "Shane" on a paper cup and served the next person in the queue, instead. Do you have any experience with psoriasis? What do you think could be done to raise awareness of psoriasis?